To restore or not to restore...That's always the question. With antique tribal flatweaves increasingly scarce, some pieces now on the market display extensive repairs--looking belabored, tired and clumsy. We can only wish that beautiful weavings botched by inept hands and poor materials had not been touched. In other quarters, fragments and battered textiles are enthusiastically promoted, their ragged condition proclaiming their antiquity. While small "fragments" can be easy to display, many collectors are unprepared to deal with twelve or fifteen-foot-long ragged and unrestored, but powerful, dramatic Anatolian kilims. Twenty or twenty five years ago, nearly all old pile rugs deemed "collectible" were routinely and completely restored to satisfy a clientele demanding "mint" condition. Today, a few collectors profess less concern for condition, and place more value on age and aesthetics. Yet we are also now seeing late 19th century Caucasian pile rugs on the market which have been so extensively "re-piled" that little of the original remains. It is hard to know what should be acceptable. Attitudes vary immensely. 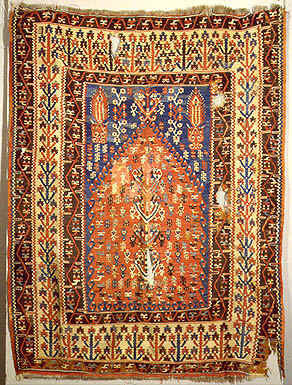 It's a fact of life that antique tribal rugs and other weavings are rarely found in perfect original condition. We can expect 19th century kilims and bags to nearly always have holes and frayed areas, if they have not already been "repaired." Iron oxides in the dyes--in browns and blacks especially--corrode the wools over time, and this natural aging process raises inevitable restoration and conservation issues. While corrosion in knotted-pile rugs can wear away the pile but leave the woven foundation intact, oxidized brown weft yarns in a kilim expose the warps, as in the photo here, leaving the piece unstable. With 19th century kilims, reweaving these areas is an option worth considering, if talented restoration people are available. With pieces that we intend to use on the floor, it is important that weak or torn areas be rewoven or stabilized to prevent further damage. Early pieces that we expect to hang or mount, however, raise different issues. Should we attempt to make ancient textile art look new? Anyone wanting unblemished pieces is better advised to purchase new production, or at least stick to 20th century pieces. The enchantment of antique weavings is dependent upon archaic imagery, of course, but also upon beautifully mellowed natural-dye colors and surface patinas that cannot be simulated. Flatweave pieces made for hard use in a nomadic tribal environment will naturally reflect that difficult life. It can seem artificial to routinely remove all problematic parts of these textiles' histories--to sanitize the primitive woven ethnographic objects that we collect. Personal preferences vary, but I personally prefer to leave unobtrusive, competent tribal repairs untouched. Sometimes holes have been carefully crocheted shut to prolong an item's useful life. I've even had old nomad grain sacks that were patched with pieces of hand-knit wool socks. I cannot recommend removing those quaint additions! I think that the earliest surviving pieces--those from the 18th century or before--should normally be left alone, and simply mounted on canvas supports. With pieces of medium age, however, there are varying ways we can approach restoration or conservation; thus a case-by-case judgment seems appropriate. It sometimes seems reasonable to reweave distracting holes, while leaving minor frayed areas untouched. Replacing missing ends or warp fringe seems extreme. It is always difficult to know whether or not to replace eroded weft yarns, but if the design is obscured, I frequently favor reweaving. Such work on slit-tapestry kilims seems far more sensible than the extensive re-piling of knotted carpets that still have intact ground weaves. As a former weaver myself, I've always tried to imagine what I'd prefer if the kilim or rug had been my creation. I believe most artisans would like to see their best works carefully salvaged--but only by cautious and sensitive hands. An appropriate analogy might be that of the furniture restorer. It's usually sensible to replace or repair a broken chair leg, or repair a desk drawer so that it is useable, but it is madness to sand down and thus destroy a beautiful old surface patina. A museum conservator, however, might not be concerned that the weakened chair leg actually be functional, and so take a slightly different approach. He would probably consider replacing missing hardware essential to the effective presentation of an 18th century bureau, but perhaps unnecessary for a 14th century cupboard. There are no hard and fast rules. For old kilims and other flatwoven pieces, it has always been difficult to find competent restoration people. The work is more exacting than pile-carpet repairs, and the color, texture, luster and size of yarns used for reweaves must match the originals perfectly--a very difficult proposition. Few restorers have the skills to work on complex weaves. Since I was a weaver myself for many years, when I started buying tribal pieces, I did small repair jobs myself on weavings that I bought for resale. But over the years I acquired far too many such pieces and the repair piles multiplied. Finally, in recent years, I've been delighted to find a few superb kilim repair people in Turkey, and reliable friends to oversee their work. As more options have become available, my attitudes on restoration issues have changed. Some pieces that I bought years ago, I've taken back to Turkey for restoration. I've begun buying pieces I would not have considered previously. I've bought the most beautiful early 19th century pieces I could find, paid for the very best repair work, and then have learned to wait patiently several months for their superb restoration. I've occasionally paid more for the restoration work than for the piece itself. For me, the business has changed considerably and it's now truly a delight to receive my shipments. The work I'm getting is now so fine, it's nearly impossible to find most of the reweaves done with hand-combed, hand-spun, natural-dyed wool. These areas are rarely identifiable in photographs, and most people instead mistakenly assume that areas with abrupt natural color changes--"abrash"--must be the repairs! Thus most of the kilims that I am offering now on this website are in excellent condition, most having had at least some small repairs or re-weaves. When there has been extensive restoration, I've discussed that in the texts. I've started a separate section, Unrestored Collectibles, for pieces that would benefit from restoration or conservation work. Most of these weavings can also be mounted and displayed as they are. I have posted a sampling of pieces below that demonstrate the dilemmas that typically face conservators and restorers. 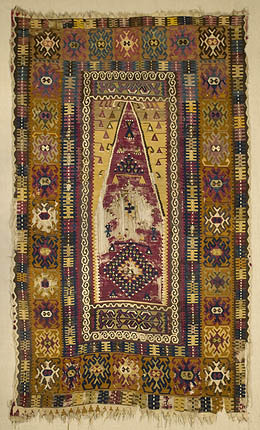 Here you see a bold early Karakecili kilim, photographed before any work was done. After looking at the piece for some time, I decided to reweave the most distracting eroded browns on this piece, and replace crude center stitching which was not original. I did not touch the outer borders, however, and I left other minor frayed areas alone. 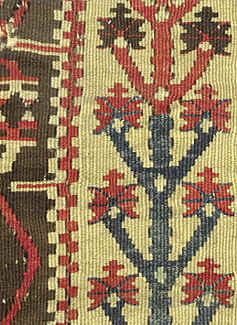 Click here to see this kilim with the selective restoration work completed. 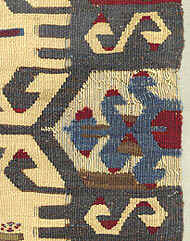 Before photographing this small prayer kilim I had already rewoven narrow, corroded brown border parts. 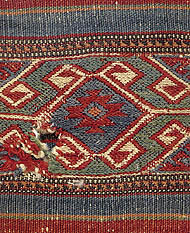 Since a slit-tapestry weaving has no separate ground weave, the piece was in shreds. My intention was to continue this work along the lower outside borders, but it seemed inappropriate to reweave the center, with its intricate but missing medallion. I think the piece should simply be mounted and hung. The subtle colors in the rosette border are breathtakingly beautiful--deep ochres, cochineal magentas, yellows, blues and soft gray greens. In spite of its problems, I could not resist this jewel! Nor could I resist restoring it to a state that ensured its more likely survival. One note for die-hard Turkmen enthusiasts: The Yahyali area was one place supposedly settled by early Salor migrants in Anatolia. It's not the Salor weaving you would expect, is it?! 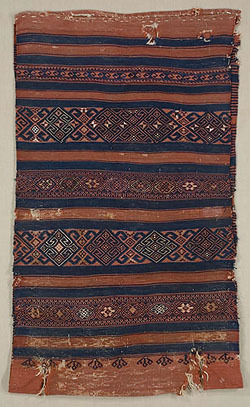 Only a portion of this long kilim is shown. A great many of the brown areas were corroded, but nearly everything else was intact. My inclination was to do no restoration to this piece. It was sturdy enough to hang without being mounted, even though there were small confined areas of exposed warps. A detail appears near the top of this page. Wool and cotton. Slit tapestry. 5'5"x 12'8." I bought this stunning kilim several years ago, debated for some time what to do with it, then finally took it back to Turkey and turned it over to the best restoration people I know. The browns were corroded--primarily in the borders, but also in a few parts of the field. Thus the restoration was relatively simple and direct, just time-consuming and expensive. As with the kilims above, I acquired this piece several years ago, and put it aside, thinking that later I'd find time to work on it. That is fortunate, because pieces this early have now become very rare. 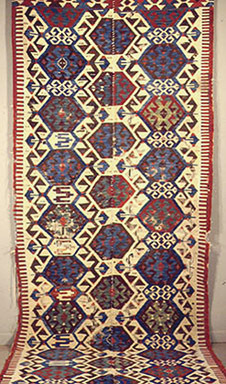 This kilim, which probably dates to the 18th century, had several areas of old reweaving which were not only poorly done but had also changed in color. I replaced most of the brown reweaves that had faded to a muddy gold, then stopped -- wishing to consider carefully just how much reweaving was appropriate. I photographed the kilim at that point. Now I am inclined to continue replacing yarns such as the faded red reweaves in the upper left center of the mihrab, but leave missing areas alone. In my opinion, this frail piece should then be mounted. Northwestern Anatolia. 28" x 48"
Wool, with touches of cotton and silk. Since my first trips through Anatolia many years ago, I have been enthralled with ala �uvallari from the Bergama area -- pieces so scarce that until lately they have received little coverage in the literature. With intricately brocaded bands, they are sophisticated textile art that is best appreciated at close range. The problem: These storage sacks received hard use, and thus when old examples have survived, most are beaten, battered and patched. Even those collectors who say they aren't "condition challenged" seem to opt for pieces "tidied up" by restoration. These bags present some of the most difficult dilemmas: The brocading is hard to duplicate, and it is difficult to match yarns precisely in plain flat-woven areas. So what is the answer? I have collected rare, ragged examples from several tribal groups when I could not resist, and then was uncertain exactly what to do with them. Every now and then I pull one out and spend some time admiring it. 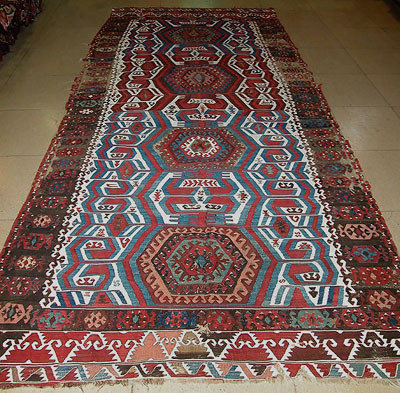 Remember those austere red and blue Y�nc� kilims with their dramatic hooked columns? Just as they have become rare, so have these richly brocaded bags that complemented them in the Y�nc� nomad's tent. We need to see the best of both preserved.